The five-o’clock news anchor tells us that Tower Mountain was kissed by lightning, that it went up like a harvest bonfire before emergency crews responded. “There have been more than 1, 000 wildfires in Arkansas this year, ” he says, “mostly in rural portions of the state.” He makes some awkward Smokey the Bear PSA about cigarette butts and camp fires, but I cannot imagine smoking in this heat — the clock at Pulaski Bank read 113 last Wednesday — and campfires are surely out of the question. I look out the window at my browning summer garden. I’m running a deficit of national proportions to keep it watered. We haven’t had good rain in this part of the state since late June, and I suspect we won’t see any until September. The sun is sucking the life out of the heartland. In a more dramatic moment, I might mention John Steinbeck. In seasons like this, I wish we could conjure rain. The Zuni, the Cherokee, tribes in East Africa, certain Eastern Europeans, they all had rainmaking rituals centered around dance. I suspect these traditions are ancient, fraught with meaning and complex. I neither dance, nor am I ancient; I lament this. Instead of dancing, I stare from the window and dream of rain, how it comes in Autumn like an old earth-lover to germinate the fall seedlings. It pitter-patters on the tin roof of the carport, builds to a crescendo like miniature drums. Droplets splatter onto the old stone walk way, slide off into the dust of the earth leaving snaky trails until they are received into the waiting ground. Earthworms rise from the deep in a greeting, and robins swing from their waiting branches to feast. All nature waits for rain. As I finished, a clap of thunder shakes the field. The sky opens up and I watch as the Italian zucchini leaves are pelted by precipitation. Perhaps it’s coincidence. After all, I’m no old-world conjurer. But then again? This month’s found poem theme at Tweetspeak is Rain. We’re compiling poems touching on the subject (no matter how loosely), and we’d love you to join with is. How do you participate? worn like a million women before her. Her deal made -a fair trade. Congratulations, Grace! 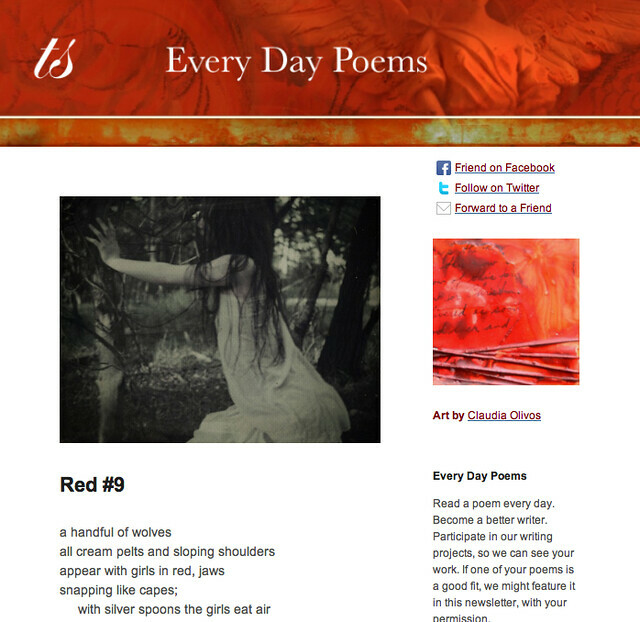 We look forward to featuring your poem in an upcoming Top Ten Poetic Picks. Now, go generate a new work and come back here and rain it on us! Photo (top) by gogoloopie, Creative Commons via Flickr. Post and book spine photo by Seth Haines. Buy a year of Every Day Poems, just $5.99— Read a poem a day, become a better poet. In August we’re exploring the theme Rain. Great poem! I noticed several of the titles (but not all!) before I read the spines. This was a really fun exercise. It takes a little time and a bit of creative manipulation of punctuation, but I found it to be a really fun prompt. Thanks for reading. Let us know what you create! Seth, it rained after you wrote your lovely piece for TS Poetry? Because it poured for weeks when I finished mine. Conjuring with words. Love it. Yes… it was absolutely crazy. Unfortunately, it only fell for about 30 minutes. Maybe I should try again this evening? P.S. I love those words in Cry. Well when you compose that kind of a poem? Grace… I really liked it. I could go on about the rhythm in it, but I’ll just leave it be for now. Hope you’ll jot a bit of a book spine poem and share it with us here! I’m not altogether convinced you’re not an old-world conjurer. 🙂 Great piece, Seth. Maybe in another life? Thanks, Dave. And by the way, it looks like we live mere hours away from one another. You’re welcome. I’m in south central Missourah, just 30 miles north of the Arkansas border. Where are you, sir? I hold it down in NW Ark. Specifically Fayetteville. We say “woo pig” here, but we’re still quite civilized. Come down for the farmer’s market one Saturday and I’ll buy you a cup of joe. Thereafter, you can write a poem about the bluegrass bands with shaky cigarette stained fingers and shakier vibratos. I love the images here. They seem epic. a small attempt…but fun. Thank you! A great attempt! Keep them coming! everything i need to know i learned in kindergarten? are where there is light? we are all old world conjurers? Seth, I loved your piece, and I hope you don’t mind that I borrowed a wee bit because I couldn’t resist trying it on. alas, there is no rain in mine, but I am determined to find some WET titles at the library! Good work, Donna, and I never mind if you borrow a wee bit. We’re here to prompt! Us, gypsies, wanderers of the world. the things they carried, forgotten. Magical beginnings, enchanted lives, separated. Seeking Utopia with the praise of folly. We exchange the living bible for fun with hand shadows. dispatches, from the war room, letters from the earth. Adventures in gentle discipline for an ageless body, timeless mind. For us, the birth of tragedy. the art of racing in the rain, struggling to touch the earth. desire to be the know it all. The paradox of plenty, the death of common sense. Turning to one another: simple conversations to restore hope. I immediately saw things I would change after I posted. But I LOVED this prompt. This was a lot of fun. Thanks. Casee, I really loved this line – “We exchange the living bible for fun with hand shadows.” It’s definitely a winner. I hope you keep playing along this month. 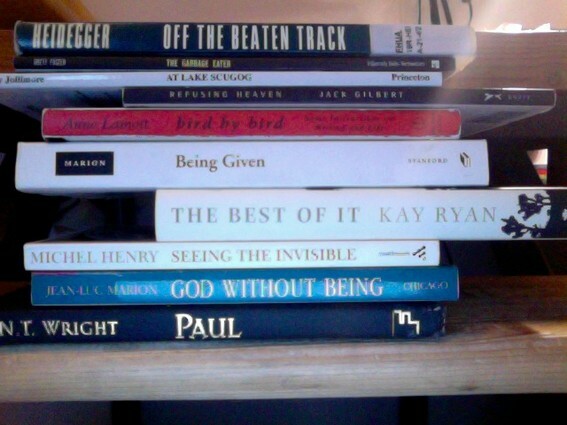 Hey, here’s my book spine poem (photo here). Seth, I’ve really enjoyed your writing this month. Not just this article but the ones you’ve written since (I’m commenting here several days after this first posted because it’s taken me that long to craft my first poem!). TSPoetry will be blessed if you keep writing here. Thanks for the comment and I hope you keep coming around. I loved the creativity and effort you put into that piece. The result was very nice. And as an aside, All is Grace? That book wrecked me. I haven’t fallen off the face of the earth. Yet. Great poem. You say a great deal through combining your book titles. I hope you keep dropping in here… hope you keep submitting. they came from a lineage of grace. wild apples lay on leaves of grass. and follows the stone crossings home. elegant gathering of white snows. to the princes of the Milky Way. where every bush is burning. and dawns mistaken for dusk. of you my heart has spoken. Love how you worked in Cry, the Beloved Country! One of my favorites. I’ve lost count of how many times I’ve read it.